Happy Father’s Day! 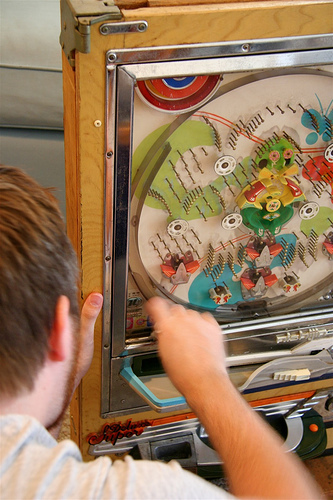 Hope all you dads out there are as happy as this one here, playing with his new garage sale find, an old 1950s Pachinko game. that is just amazing. look at the attention to detail on that thing, the hinges are so well crafted. That blows my mind because we had the exact same one! The lights never lit up, but it was awesome anyway. WOW! I’ve never seen one of these before. It’s very cool. That game is beautiful; what a find! That looks so cool! Does it work? Don’t those colors just make you want to run to your table and create? They do me! Love the combinations! Have fun with the game! We had one of those growing up. I loved that thing, I think my mom sold it in a garage sale a long time ago. how sad. Enjoy yours! That is so cool, love the colors! We’ve got the same one too! Ooh! I know a Daddy that would love to have one of those for himself! Have fun! Coolest photo EVER! Hope daddy had lots of fun! We had one of those growing up! Could never figure out how to get it to work! I loved playing a pachinko machine when I was a child. I used to spend hours at the machine. Last weekend I tried to recreate a bit of my past and picked up a pool table at a yard sale for $35.00. Dh wasn’t as excited as I was. Perhaps it was the size….? Next time I’ll try the pachinko route. Oh, my husband would be jealous!!! Oh wow! A pachinko machine! We have a red one, but I’ve never seen another one until yours! what a fantastic find! I know a man who would love to tinker with an old toy machine like that.